Olivine can help to reduce CO2 by binding it, how? When olivine (Mg2SiO4) weathers, it binds carbon dioxide (CO2). Water (H2O) and some warmth is all that is needed to get the process going. No complicated technology, cheap and safe. The result is harmless bicarbonate and silicic acid. Rivers take it to the sea where it forms, among other things, coral reefs and dolomites. The CO2 has been permanently bound. 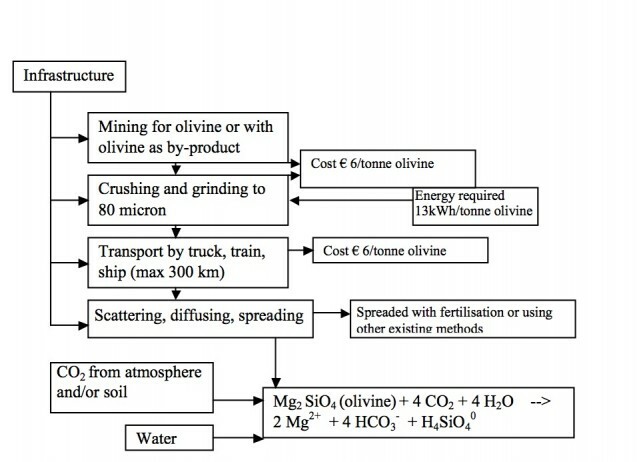 The weathering process of Olivine is not a complicated technology. Nature has done it this way for millions of years; the manner is copied from Mother Earth. It is cheap and safe. Olivine rock weathers very quickly. And moving water can speed up the weathering process. In actively moving water, small pieces of olivine move around, touch each other, and their layers of silica are removed to expose the olivine underneath for further weathering. Enhanced weathering is literally a very down to earth method. It comes down to mining lots of Olivine rock, then milling it down to the level of sand, and subsequently spreading it in a humid place, where CO2 will dissolve in water and react with the Olivine to be converted to bicarbonate. That’s it!